Calling up different experiences, images, emotions and stories from past life and making sense of them from the present is the business of oral history. I joined other PhD students from across Scotland at an excellent University of Strathclyde oral history training day last week. The methodology clearly has wide appeal as, while I’m researching practice change in speech and language therapy, I was joined by people from disciplines including music, anthropology, politics, history, literature and sociology. We learned that oral history is usually used to explore areas of life that are not well documented, or where particular perspectives have been excluded. As memory is not well suited to reconstructing an accurate past, oral historians instead harness it as a powerful way of interpreting what events in the past have come to mean for the people who remember them. This may be more varied and diverse than we expect. The way we record memories is partial, and depends on what else is going on at the time, or what captures our interest. We retrieve memories in different ways, often helped by visual and sensory cues, or going back to particular places. In oral history interviews, interviewees also decide what to remember and how to tell it. This is always influenced by how they relate to the person who is interviewing them, and what other events have happened around the time of the interview. One of the most interesting discussions for me was how memory is dynamic. This means our memories continue to adapt or change depending on how the same event, idea or experience becomes talked about and remembered publicly or collectively. While this can give some people a framework for talking about their experiences, it may make recall difficult for those who struggle to make what they remember fit the popular imagination. The excellent Where Methods Meet series of videos shows that research methods often have much in common, and much to offer each other, and that’s certainly the case for oral history. In addition to well-developed ideas on memory and the social nature of an interview, I learned from the training day that oral historians have particular expertise around the ethics and logistics of archiving data, as well as engaging communities through research. In the equal pay oral history, Margaret Evesham has interesting memories on the contrast between therapists who had rich husbands and those who were single parents, and Pam recalls the injustice of a male clinical psychologist colleague earning considerably more with less of a research portfolio. Lesley Cogher remembers feeling guilty when she was awarded the settlement, until the Union solicitor said, “You can’t run a health service on the backs of underpaid women”. In a review of oral history in Scotland, Angela Bartie and Arthur McIvor noted a gap on the meaning of work in the professions, so I hope there will be more opportunities to explore speech and language therapy in this way. Using oral history in social science research: a workshop for PhD students was organised by the Scottish Graduate School of Social Science. 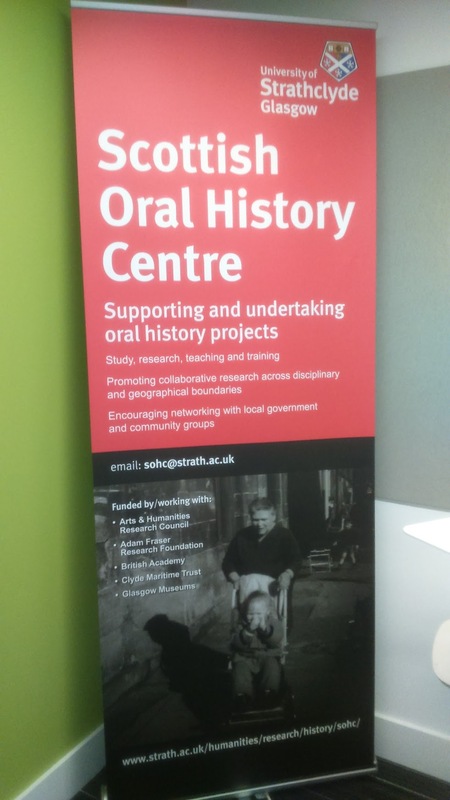 It was held on 4th November at the Scottish Oral History Centre, University of Strathclyde and led by Arthur McIvor, Erin Jessee and Alison Chand. Primary qualitative research in its many forms can help us understand how and why people experience the world in different ways. Qualitative synthesis is an umbrella term for methods used to bring reports of primary qualitative studies together. The aim of qualitative synthesis is to say more about a phenomenon than each included study could do on its own. Meta-ethnography is one approach to qualitative synthesis that researchers can draw on when designing a study. Meta-ethnography was pioneered by George Noblit and Dwight Hare as an alternative to aggregative approaches which summed studies but failed to show what could be learnt from them. In 1988 Noblit and Hare published the seminal “little blue book”, Meta-Ethnography: Synthesizing Qualitative Studies. While this remains the foundation text, the context in which meta-ethnography is being designed and conducted is today very different, with researchers (as people) interpreting the principles – and how to put them into practice for different purposes – in different ways. What’s the purpose of meta-ethnography? Given that I am attempting a meta-ethnography as part of my PhD, I was fascinated to hear what George makes of developments in the field. 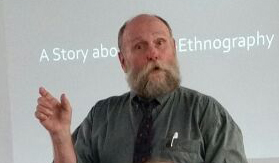 He is passionate about synthesis methodology, and refreshingly relaxed about what people do with meta-ethnography as long as they are clear how they are going about it. However, as researchers help to construct ideas about society, he would prefer they use it for interpretation (to reveal taken-for-granted assumptions) and critique (to reveal how these are structured by power and ideology). This includes noticing what in the included studies could enable people to choose to do something more about their situation. What are the implications of current practice? needs to include all studies of a phenomenon (when it is more appropriate to layer the synthesis through iterative readings and more and more specification at each stage while preserving complexity and context). George believes that misunderstandings of Noblit and Hare’s intentions have influenced what as well as how people have chosen to synthesise. As a result, if he was re-writing the book now, he would make two other methodological aspects of meta-ethnography clearer. The first misunderstanding is that synthesis is literally of the ‘findings’ of included studies. Authors of a paper construct the whole account, and report their results in a way that fits this account. As there is more in accounts than the words say, there are clues for a synthesiser in the introduction, methods and conclusions sections as well as in the findings / results. George wishes he had used the term ‘storylines’ to show how synthesis can reveal what is not apparent in the individual stories alone. While the authors’ choice of themes can be used to explicate storylines, theme-to-theme synthesis is overly reductionist. George says it may therefore be appropriate to re-theme an account, “mess with” the authors’ interpretations, consider the connotations of terminology, and find the unacknowledged counter-stories. The second misunderstanding is that the synthesis is about what is said in the accounts without considering the contexts in which they were produced. George sees this as “a real failure of our book”, as it is essential to add context to a synthesis that isn’t in the individual studies, such as what could or could not be said, the influence of time, geography, and professional cultures, or relationships between the researchers and the studies. “Even speculative context is helpful”, and he finds a historical perspective good for unpicking assumptions. How can we contribute more through meta-ethnography? The combination of storylines and context enables synthesisers to think about connections, and through this to understand mechanisms, which George believes is an essential contribution of a meta-ethnography. Acknowledging that observing and contemplating takes “forever” and can be “pretty boring”, he emphasises the need to play, to find ways to pay attention to what we are learning at each stage, and to notice what we may take for granted (for example by using a dictionary to consider older and newer meanings of words). George proposes thinking of knowledge as a verb rather than a noun. This perhaps fits with his preference for using “I” in academic writing, a field that is more known for its pursuit of an abstract, formal tone through the use of nominalisations and third person. He also believes that a meta-ethnography should offer a comment on a field of study – including how knowledge gets constructed – and set a research agenda. In view of this, George suggests making it more participatory and accessible, with every step open to experiment, comparison and critique so we can discover what differences make a difference. Professor George Noblit was in Scotland from 20th-24th June 2016 to work with the the eMERGe project team, who are developing a guideline to help researchers improve the quality of their meta-ethnography reporting. The seminar for researchers at Stirling University was arranged by Emma France of the NMAHP Research Unit, and the public lecture at the Dovecot Studios, Edinburgh was hosted jointly by NMAHP RU and the Scottish Collaboration for Public Health Research & Policy (SCPHRP). A video of the seminar and a Q&A chat with SCPHRP’s Ruth Jepson will be available soon. Penny Tinkler presented an IIQM webinar this week, ‘Talking about photos: how does photo-elicitation work and how can we use it productively in research?’ She explained that photo-elicitation doesn’t always meet researchers’ expectations and so, in order to use it well, we need to have a better understanding of how it works. Although aimed at researchers, it struck me that this is also highly relevant to speech and language therapists who want to get the most out of using photos in therapy. Penny’s slides are available via IIQM, and the recording of her presentation is due to be posted on YouTube. She has also written a book ‘Using Photographs in Social and Historical Research’. It was published by SAGE in 2013, and a free chapter ‘Photo-interviews: Listening to talk about photos’ is available here. The International Institute for Qualitative Methodology (IIQM) webinar Masterclass series is a free resource for anyone who is serious about doing qualitative research well. All webinars are archived as slide presentations and on YouTube. Having spent many years editing ‘Speech & Language Therapy in Practice’ magazine, it’s not surprising that an event titled ‘Qualitative health research in practice’ had huge appeal. In placing the focus on exploring the many processes of doing qualitative research, organisers Cath Exley, Nina Hallowell and Tim Rapley created a friendly and stimulating space that enabled PhD students and early career researchers to bring uncertainties, challenges and realities into the open. The real mark of a worthwhile event is not so much what it does on the day but how it continues to percolate. This will work in different ways for different participants. For this reason, my blogpost doesn’t offer a speaker-by-speaker account. Instead, I hope to show how the event is already helping me reflect on aspects of qualitative research practice that really matter. Our framing of the problem for investigation informs our research choices, and thus builds assumptions into all aspects of study design. These assumptions affect everything from who we recruit and who we do not, to the data we generate, to how we choose to share our findings. Framing is a political act: it accepts or challenges the status quo, it is done and used for different purposes, and it can enable or prevent us hearing what may be central to a problem. Framing ‘the problem’ can involve critiquing dominant assumptions, but challenging our own assumptions and recognising where, how and why they may be coming into play is integral to all good qualitative research. As clinician researcher David Hamilton said, we are filters of – not windows on – data, and we need to be honest about our sieve. Exemplifying this kind of honesty, Siân Benyon-Jones explained how she made assumptions about procedures she would have to put in place to get her study through an NHS Research Ethics Committee. She got ethics approval but, because she hadn’t designed her research around the needs of the study, recruitment didn’t work until she problematised those assumptions and changed her approach. All research is partial. Jo Wildman’s paper made me wonder how we can remain open to the possibility that we are missing something significant because of our study design. Jo is doing mixed methods work with the Newcastle Thousand Families Study cohort, which has been providing longitudinal data since 1947. She explained that how we see ‘healthy’ or ‘successful’ ageing has largely been limited by quantitative methods with a biomedical slant. While they provide an important chronicle of trends, associations and timings, they can’t recognise variation in what is meaningful. However, Jo’s in-depth qualitative interviews have captured narratives of successful ageing as ‘going and doing’, along with the previously unrecognised importance of social ties and relationships. This new knowledge has enabled the research team to adapt quantitative data collection accordingly. The choices we make about the setting of our research also influence what we might be missing. As Diane Trusson has found, being outside a medical setting may mean participants construct their stories differently, so they are much more contextualised as part of their life. Rupal Patel also took her research into the community so it would be more inductive, and one consequence is that her data is full of complexity and contradictions. Rupal therefore drew our attention to one of the dilemmas facing qualitative researchers who have a remit to inform practice or policy: to what extent do we work against this complexity to find ‘an answer’, versus working with it to present the diversity of what exists? Qualitative research is about people in their social contexts. People are active agents, not passive blank slates. Roles are not fixed, and people and relationships are always changing. As Jenni Remnant reflected, this means that any kind of collaboration introduces politics and dynamics that you may not be able to prepare for beyond making and fostering relationships, being nice and honest, and offering cake. A running theme was how relationship work with ‘gatekeepers’ and potential participants is crucial for study recruitment. This is not necessarily comfortable; it can involve “hanging out” at a clinic (Siân) or “lingering around” a temple (Rupal). As Siân says, recruitment needs onsite, in person work, and an information pack can’t do it. Once a study is underway, relationship work might involve communicating critical data back to your colleagues in a way that represents the difficulties they face (David). It might also mean you compromising your own preferences to accommodate those of your participants, as Siân found when she discovered many preferred a telephone interview over face-to-face. Qualitative research is full of concepts that have been proposed as holistic and are therefore unlikely to be definable in one way. Ashok Patnaik, for example, finds ‘culture’ has become “a vast, global, aggregative concept” that is applied in a “wildly” divergent way. He argued that it has become so “hollowed out” and conflated with other concepts that it is of no practical use. Ashok proposed dealing with such “quicksand” concepts by having narrower and tighter definitions with operational consistency, clear boundaries and uniqueness. I think this is one possible strategy, but I can’t go along with it as a rule of thumb for qualitative research – one of the strengths of language is its fluidity, and the way you choose to handle a concept and its boundaries depends on why you are using it in the first place and what you want it to be able to do. On the other hand ‘rounding out’ concepts (Tim Rapley) is undoubtedly qualitative work. The emotional work of research was raised one way or another by all speakers. Tim observed that there is a tendency to use the concept as “a gloss” and we need to take it more seriously by rounding out what these emotions are. d) These holes will lead you to ask ‘why?’ which directs your next steps. In some qualitative research, ‘rounding out’ concepts is key to ‘theoretical saturation’. Questions were raised about the possibility of theoretical saturation, which may partly be a consequence of common misunderstandings, but may also reflect a deeper unease. This has been addressed from a realist perspective in a recent blog by Nick Emmel. Being open about the what, why and how of our processes is essential to developing as applied qualitative health researchers with sociological imagination. As a clinician researcher, David Hamilton wants to play a bridging role, but is aware of the danger of ending up with the worst of both worlds. The work of sociologist Erving Goffman has clearly helped David notice the ethical and practical tensions of his dual role and how these play out in the front stage, backstage and subplots of his settings. Once we become aware of what might be going on, we can’t pretend it doesn’t exist. Valuing and being transparent about process therefore takes courage, but may leave us better equipped to embrace the accidental (Diane), live with uncertainty and change (Jenni) or enter the unknown (Becca Patterson). Becca is in the first year of her PhD. Her presentation reminded me how much preparatory work is needed before you even know if you will get funded, and of the importance of creating your own support network early on. Now in my second year, this conference was my first go at presenting an aspect of my PhD to an external audience. I spoke about why and how I have used a realist sampling strategy in the early stages of an intended meta-ethnography. This prompted discussion about there being no one ‘correct’ way of synthesising primary qualitative research reports, hence the research community should stop looking for one and concentrate instead on describing what we do and why. Preparing a presentation, delivering it, being questioned on it and getting informal feedback is nerve-racking. However, it is also a fantastic way of understanding what you are doing, who might be interested in it, and how it might make a contribution. 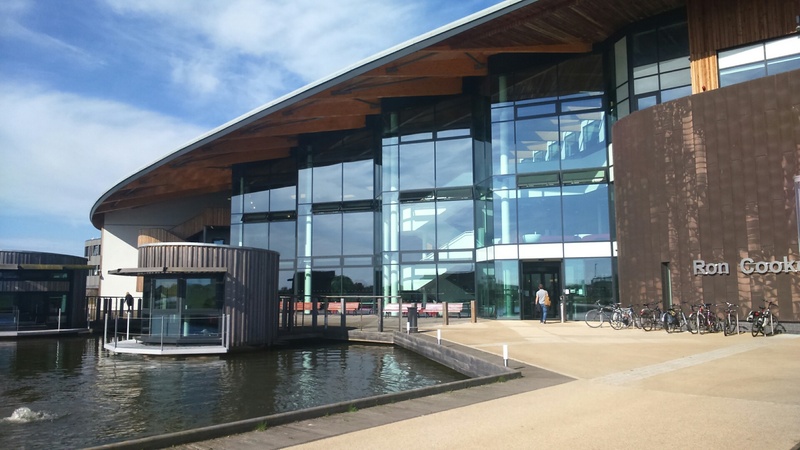 The British Sociological Association MedSoc Applied Qualitative Health Research Group event (#AQHR) was on 13th May 2015 at York University. Speakers were: Siân Benyon-Jones, University of York; Diane Trusson, University of Nottingham; Rupal Patel, University of Nottingham; Jenni Remnant, Newcastle University; Avril Nicoll, University of Stirling; Ashok Patnaik, University of Huddersfield; Jo Wildman, Newcastle University; Becca Patterson, Newcastle University; David Hamilton, Newcastle University.